Made in Picton, New South Wales, Australia, 1997-2006. The Bosdyk doll’s house is a unique example of the art of the miniature. It competes with the very best in the tradition of Dutch dolls’ houses, renowned in the seventeenth century for their style and extraordinary attention to detail. That this should have been made in Australia is unusual, and the Bosdyks’ eight years’ dedication to the project is an extraordinary achievement. The story is one of Dutch migrants bringing the very best of their traditional culture and skills to Australia. Dolls house constructed in two sections, attic level and main house level. The wooden doll's house and contents is made to 1/10 to 1/12 scale with 20 rooms and a working electrical system for lighting. The style of the building and rooms span a period from late nineteenth century to 1950 and have a Dutch character evident in the Delft tiles, the Vermeer reproductions and pictures of windmills hanging on the walls and the decorative silver and pewter ornaments. Each room is set up with furniture and effects with small dolls representing people going about their daily tasks. Each item of furniture contains perfectly scaled objects in drawers and cupboards that open. Many of the pieces are fixed in place. From the top left is the boys' bedroom, sewing room, boys' room, games room, grandma's room, upper landing 3rd floor, babies' room, maid's room, maid's living room, laundry, landing 2nd floor, bathroom, nursery, library, landing 1st floor, bedroom, kitchen, hallway, toilet and dining room. At each side are balconies and windows with shutters.The top attic has an angled glass roof which opens like a lid and the house stands on a base with legs and two drawers storing the electrical controls and spare components. Frans Bosdyk signed the underside of many of the items of furniture with their completion date. The house was built and decorated by Frans and Christina Bosdyk over a period from 1997 to 2006 when Christina sadly died. They estimated that they spent 15,000 hours and many thousands of dollars of materials on the work. Frans made most of the furniture, which he researched in 'Antique Furniture in Australia' by Anthony Hill, and developed special lathes to turn the tiny wooden parts. Frans knows the different qualities of woods and which are suitable for certain tasks. He also fashioned his own tiny hand tools from 75-100mm concrete nails to make it easier for him to handle the small pieces. He used silky oak, cedar, myrtle and blackwood which formed the 3mm floorboards throughout. Frans researched styles and how to make lights, lamps and electric sockets, which all operate, from websites and publications from Europe and the US. Christina was closely involved with all construction decisions, sourced miniature items, decided where everything went and chose interior decor, wallpaper and dolls. The process was documented in a collection of 800 photographs. 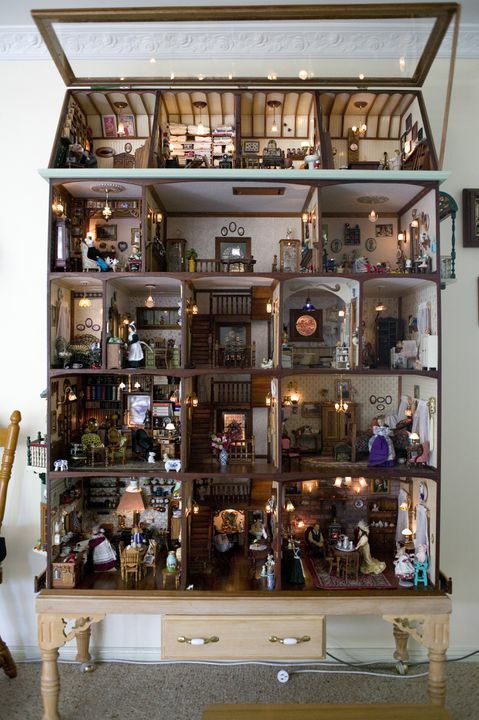 The doll's house is heavily influenced by traditional 17th century Dutch dolls houses. It is equally intricate and detailed and was made by the two owners themselves, unlike the wealthy 17th century Dutch merchants' wives who would have commissioned artisans to do the work for them. It is hard to imagine anyone spending so many years exclusively on a single project. Christina's favourite rooms are the sewing room, the games room and the library, while Frans is very proud of the kitchen, the library and the hallway.